As part of the Schoolhouse Review Crew, I received a Student Strengths Report online assessment from PeopleKeys to review. 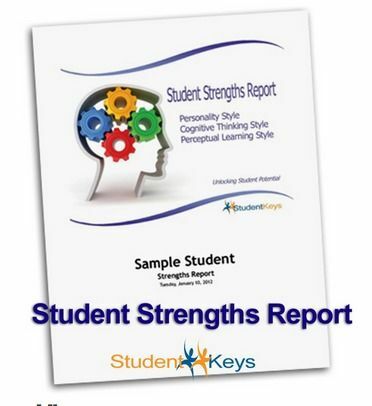 The Student Strengths Report uses three unique assessments (DISC Personality Style, Perceptual Learning Style, Cognitive Thinking Style) to provide a simple, yet profound, tool to help students uncover their personal strengths, then apply that information to everyday communication and learning situations. The Student Strengths Report will help students recognize their distinctive personality strengths, learning styles and thinking preferences. The Student Strengths Report is for ages 13 to adult. I had my 14 year old, 9th grade daughter take the Student Strengths online assessment. She was a little nervous to take it. She was afraid to get something wrong. I had to reassure her numerous times that there were no right or wrong answers. Once she settled down, she did fine. The assessment only takes 10-15 minutes, depending on your student. It is basically a questionnaire that you answer. Each question has several answers to choose from. The student picks the answer that best describes them. The instructions tell the taker to go with their first answer, not to spend time thinking about the answers. After you complete the test, you will receive an email with instructions to download your report. You really get a lot of information from this test. The report that I received is 34 pages long, in PDF format. The report starts with introducing the personality styles, then describes each one. Then I had two pages with my daughters personality style, including a graph. The assessment said my daughter is a Communicator. Here is a little sample from my daughters results. There is so much information in the report, that it is impossible to share it all here. Included in the report are learning styles. And even a section on how to set up your learning area based on your learning style. Something that is very important for all students. But that can really be put to use in the homeschool, where we have control over our learning environments. Even if your child is not homeschooled, you could use this information to set up the students homework area. There is another section on Cognitive Thinking Styles. My daughter is an intuitive thinker. The report includes ways that she can put her strengths to use in groups, or when working alone. Over all, I found the report to be accurate about my daughter. And I can see her, and myself, using this information for her benefit throughout her high school years. And beyond. The Student Strengths online assessment sells for $20 on the website. There are discounts for buying 5 or more tests at one time. See the website for more information. I was really impressed with the results for my son, too. Although, it’s got me thinking about how I need to alter my approach to teaching him as his preferences and mine do not fully align.